I understand my educational limitations with regard to making medical judgments, but I have to conclude that a recent campaign by a New York City urologist has to be skating mighty close to the ethical line. That this would be offered by an affiliate of the North Shore-Long Island Jewish Health System, which has an outstanding record of patient quality and safety, makes it all the more strange. Lenox Hill Hospital, part of the North Shore-LIJ Health System, is offering a free informative evening on Thursday, January 8th from 6-7:30 p.m. with David Samadi, MD, chair of urology and chief of robotic surgery, about what women can do to help keep the men in their lives healthy and happy. The presentation will be followed by a question-and-answer period, and everyone is the audience will be receiving a free T-shirt. I'm not going to go through all the recent studies about PSA and testosterone tests. You can do that on your own. What I am going to say is that in neither case is there reason to believe that an unselected population of normal men should have these tests. This doctor and through him this health system are engaged in advocacy that will cause overuse of the health care system. Add to that the inevitability of a number false positives from the PSA tests, leading to an unnecessary number of biopsies, some of which will cause harm to patients. So, we have to ask, is this a doctor doing this on his own, or does it have the support of the health system's administration? Is this a scientifically based clinical program or a business development program? Finally, the fact they are deliberately using women to get at the men and do their advertising for them is disrespectful to both. This is a tactic worthy of used car salesmen. Addendum: Dear readers, after reviewing the extensive and thoughtful comments below, please turn to the follow-up post on this topic, in which NS-LIJ Health System responds. Is it businesslike or businesslike? The difference is pretty important. Yes, healthcare needs better business methods. But when you think about it, "businesslike" seems to have two separate lines of thought, even two different meanings. On the one hand, good business is knowing your costs and recovering them, producing a better product, increasing efficiencies, etc. On the other hand, business practices can be rapacious, grab the money, go for the gold, do whatever it takes, etc. When people say that healthcare should be “run like a business,” mostly they mean #1, not #2. But if you confronted Heartland, odds are they would say “we need to run it like a business,” and mean #2, not #1. But you just have to think, is profit an objective, or a constraint? If your objective is to help people one way or another, then profit can be a constraint – you can serve people, but only with the constraint that you can't lose too much money doing it, or you will go out of business and help nobody. If, however, it's the reverse, you then want to make as much money as possible, with the constraint that you do have to help some people along the way. Or at least not hurt them too much. Or at least not get caught hurting them too much, which would then start hurting profits. So, if I look at a healthcare program, I have to think: OK, run it in a businesslike fashion, but is it businesslike #1, or businesslike #2? Are they doing well by doing good, or just doing well? The difference is pretty important. There are so many well intentioned people working to improve patient care from "the outside," often focused on creating true clinician-patient-family partnerships. I have to admire their dedication and tenacity, often in the face of passive resistance from those on "the inside." Here's hoping they stick to it and have more and more influence over time. Carol Cronin is one such person. She runs the Informed Patient Institute. 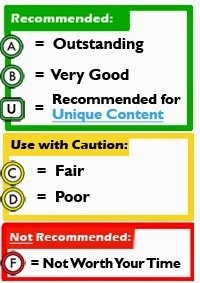 IPI rates the usefulness of online doctor, hospital, and nursing home report cards. "We don't rate individual health facilities or practitioners — but we'll tell you who does." In addition, they have recently released a sixth set of tip sheets on "what to do if you have a concern about quality in a nursing home, hospital or doctor's office." It's available in California, Connecticut, Maine, New York, Pennsylvania and South Carolina. I am confident we can look for more to come from Carol and her team. Free Monthly Webinars by Bruce Hamilton, aka "The Toast Dude," Kick off in January with "War Rooms & Obeyas"
GBMP, Inc. is a non-profit provider of continuous improvement training, dedicated to helping organizations become more competitive through lean manufacturing education and implementation. Each year GBMP trains more than 7000 people on continuous improvement principles through classroom and shop floor training sessions, and impacts thousands more in public workshops, on plant tours, during its annual 2-day Lean Conference and through its award-winning Lean Training videos and instructional games. And now, GBMP is expanding its ability to reach those who are passionate about Lean and Continuous Improvement through its series of free monthly webinars. Our Tea Time with The Toast Dude Webinars are presented on the second Tuesday of each month by Bruce Hamilton, President of GBMP. Bruce is considered by many to be one of the foremost thought leaders on Lean and The Toyota Production System in the United States today. He is the producer and star of the #1 Lean Selling Lean Training DVD in the world, " Toast Kaizen - An Introduction to Continuous Improvement & Lean Principles", co-author of learn-and-do lean training workbook "The E2 Continuous Improvement System", and a three time Shingo Award recipient. In addition to being known as The Toast Dude, he is sometimes called That Old Lean Dude - which gave rise to his blog "Old Lean Dude" - which now boasts over 150 original posts and more than 1000 followers. The first webinar (did we mention, they are free?) of 2015, titled "War Rooms & Obeyas", will take place on Tuesday, January 13, 2015 at 3 PM (Eastern). The webinar will discuss how many companies struggle with cross-functional collaboration in the pursuit of complex objectives and how War Rooms and Obeyas are used to align resources and maintain project focus for faster, more robust outcomes. Those who are passionate about Lean - from executive management to change agents working the front lines - from the manufacturing, government, healthcare and service sectors - are encouraged to participate each month, and even suggest topics for future events, and every event includes 15-minutes for Q&A with Bruce, in real-time. To register for January's webinar, please visit www.gbmp.org and click on Events or click here. 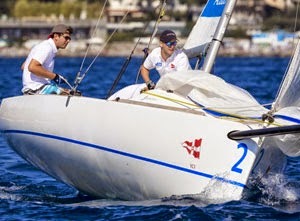 Here's the predicament: you show up at a sailing regatta, and when the other teams complain that they’ve never raced together, your team reflects that most have never even sailed. At all. And, oh yeah, your team is all MIT graduate students. But, HVE student Adam Traina leads with standard work and visual management to see problems, mid race and after race pauses to solve problems, and then discipline in sustaining solutions until the next problem. The team moves from dead last in the first round, to fifth, second, and finally an unassailable first in the final races. The students used an array of LGO ("Leaders for Global Operations") tools to work well together as crewmates. “We implemented standard work by training each member of the team for one specialized job, and we used a visual management system to cue each teammate on when to execute their tasks,” Traina said in an email, adding that their “robust verbal communication protocol” kept team members informed. Also, between each race and at the end of each day, the team held kaizen sessions to improve their processes. “The kaizens led to rebalancing workloads and new discoveries about the operational features of the vessels,” he said. 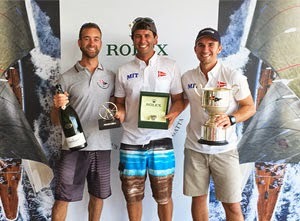 The winning team brought home a trophy and a Rolex watch, but coming out on top wasn’t their goal. The MIT Sloan team decided at the beginning that their mission was simple: "to come home with more friends than we left with," Traina said. When my daughter was a year old, she was given a diagnosis of "Failure to Thrive." The definition is something like if your length percentile keeps growing but your weight percentile falls. Anyway she wasn't eating enough. Her PCP sent us to a famous gastroenterologist who said he wanted to do an endoscopy. That would mean putting her under general anesthesia and a period in the hospital. I asked, "What are you looking for?" He said he wanted to see if her esophagus was inflamed. I then asked, "What would you do about it if it is?" He said he would give her an antacid. I said, "Is the antacid dangerous?" He said no. So I refused the endoscopy and told him to prescribe the antacid. It was both a diagnostic and a treatment. End of the story: It did nothing. Moral of the story: Don't be a nail just because your doctor is a hammer. P.S. The daughter is thriving . . . in college. If John Bewick had a mean bone in his body, no one I knew ever found evidence of it. surrounded by family, carols and Christmas light. A loving and intelligent man, with a great heart, and a warm humor, he worked to improve the environment during his life, as well as to influence the safety of nuclear power, and to help businesses in their efforts to comply with complex environmental, health and safety regulations. He valued integrity in government. 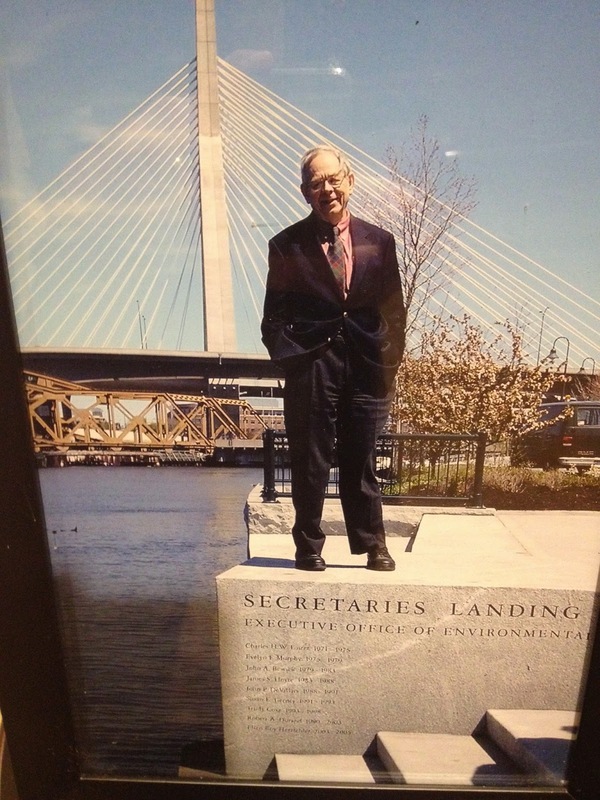 He was Massachusetts third Secretary of the Executive Office of Environmental Affairs, and his name was engraved in granite at “Secretaries Landing” on the Charles River in Boston while he was alive to enjoy it. Read the rest, too, because he was a remarkable and lovely person. At least once a year, John would write me a note, asking my opinion on some matter of public policy. He was always digging into why things worked the way they did and how they could work better. If you wanted a definition of a public servant--even when he was no longer in the government--he provided it. Actually, it was serendipitous, and it sort of speaks to the fact that, in a lot of ways, you can't plan certain things in life, that there's a lot of chance in all this. It's something that I didn't seek, but it came to me in a very interesting way. I had gotten bored at Cabot Corporation where I was doing research, and so I started to get involved politically . . . in Paul Guzzi's campaign (for US Senate) and started writing position papers. It turned out, I found out later, that I was the only person on his campaign writing position papers. We had a number of debates at his house. One of my recommendations to him was, do not go anti-nuclear, and he ignored that and followed his campaign wisdom advisors. And, exactly, as I thought would happen, the money then flowed almost immediately to [Paul] Tsongas in the campaign. All the industrial money went to Tsongas, so on election day, Tsongas had a much better election day operation than Paul. After the election, Guzzi was very close to [Governor Ed] King. And through our PR fellow at Cabot, I said, "Gee, I'd like to be on an advisory committee," and my resume happened by Guzzi's eyes after they had turned down about five people for secretary. A variety of people had been proposed to King, and he had not liked any of them--to his credit--as some were political hacks. Guzzi said, "This is interesting. I know him and we happen to be looking for someone." So it was totally fortuitous that King bought in. The Governor called John Cabot, at Cabot Corporation, and Zeb Alfred, at New England Electric; and both of them knew me, so I was blessed by those two. I was called in on a Thursday and appointed on Tuesday--King's usual careful fashion of checking people out! I had had one meeting, and I pointed out to King that my father had built the second largest bridge on the B&O Railroad and was a civil engineer, and my brother was commissioner of highways in Delaware; and I think that, with these two things in my background, he surely thought I was a soul brother or something, a builder family, and he was quite surprised that I ended up having environmental concerns. You might think that an "accidental" cabinet secretary would be politically naive and not attuned to how to manage in an administration. That conclusion would be wide of the mark in this case. For example, John always said that working with Ed King on environmental issues was a positive experience, notwithstanding the latter's less than stellar reputation among the environmental community. But the key was that John had to set up the dynamics to move things in the direction he wanted. We just had a great relationship. We did something that was very interesting. I think I was the only cabinet secretary who had a regular meeting with the Governor. We discovered early on, that if we could get the Governor's ear first on an issue, he would take our frame of reference. So quickly I started asking for appointments once every week. I took all my crew in. Here [for example] was Terry Geoghegan--BC graduate, great football team, great football player--who would come in with the environmentalists. As so there would be this quizzical look [from King], "Here come the environmentalists and there's Terry Geoghegan with them? Hm?" We got him to sign the barrier beach protective order, which I think was the most extraordinary in the nation. It was an order that said that barrier beaches are nature's way of protecting the mainland, and they are shifting formations, and you should not build on them. They have a life of their own. Therefore, the state will not do anything to invest money in protecting them. When [state representative] Nick Costello came down from Newburyport and said the folks on Plum Island want to spend $1 million of federal money to bring water onto their properties--after they contaminated their own water supply by building their cesspools improperly--the Governor said, "No, we are not putting state or federal money into the barrier beaches." Needless to say, Nick wasn't very happy. That's the sort of guy I knew as Governor that the public had very little concept of. When the going was tough, and if he believed you were right, he would be there in the trenches with you if you needed support, in contrast to some other governors. John was a street smart political scientist. We later got to the main topic of my interview, why the MDC, once known as one of the best regional government agencies in the country, had fallen to the point of permitting the total degradation of the sewage treatment system and the pollution of Boston Harbor. There's a multi-dimensional answer to that. First of all, the problems were not very visible except for the summer beach contamination problem. Even that was blamed on a rainstorm that overwhelmed the system, so "nature is doing this to us." Other than that, the people had water to drink, the skating rinks worked more or less, the swimming worked in the summertime. So the problems were not visible to the public. The second part of the answer goes deeply at the function that the political process plays in Massachusetts. For many in power, the objective of politics was to assure job for constituents, and the agency was performing that job very well. 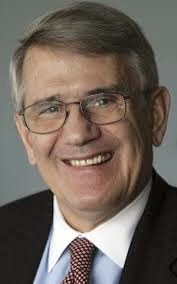 You had a chairman of Ways and Means from Dorchester; you had a Senate President--or soon to be Senate President--from South Boston; and numerous other reps with influence from the greater Boston metropolitan area. In terms of the traditional view of what politics as about, it was doing an excellent job of providing jobs for those constituents. So why change? I would attribute that in part to the lack of a two-party system. Even if you had a Republican governor, you still had the same legislature. One of the things that happens when there is tremendous political influence in job creations is that there is a deep cynicism about the quality of state service and government. Nobody is valued if everybody is viewed as having gotten there through political connections, as opposed to competence. It took us three years to get through a management pay [increase] bill [to attract more qualified people.] [The legislators themselves] assumed they were all incompetent because "I put them there. They can't be worth much because I know how they got their job." While I'll miss these kinds of insights that John had of the body politic and government service, most of all I'll miss his smile and his distinctive laugh, his joyful viewpoint on the world, and his irrepressible kindness. This was a truly good man. Here are a couple stories of Boston from my friend Charlie Sandler, who was born in 1932 and grew up in the Depression-era Four Corners section of Dorchester. He and his buddies learned how to be frugal and get by and make a bit of money on the side. At age 11, he obtained a job selling refreshments during the dance nights at the Greenwood Youth Center. During a break in the active dancing, the girls would come over to the refreshment stand and order Cokes. Before they had finished them, the music would start up again and they would run over to the dance floor. Charlie and his partners in crime would quickly refill the empty bottles with the leftovers, pop the tops back on, and then sell the "new" bottles during the next break. 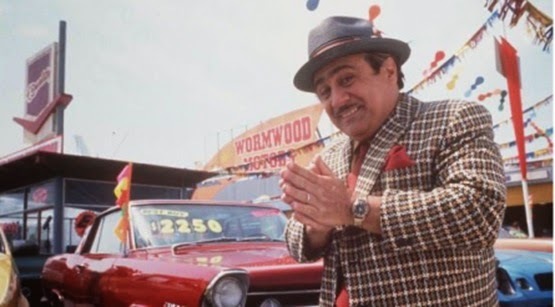 "Five cents, pure profit!" he gloated 71 years later. 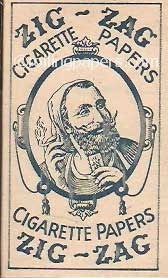 When they had enough money, ten cents, they could purchase a pack of 100 cigarette papers. Using a rolling machine, they'd produce "new" cigarettes and sell them on the street for one penny each. As Charlie summarized these and other activities, he admitted, "I was not a good boy." Something changed though, and he later devoted decades of his life to teaching vocational education. Maybe he figured if he had had a mentor like himself, he wouldn't have been quite so mischievous. Although I doubt it. My father, along with my brother and countless other extended family members, was a physician. Public health has been a part of my life as long as I can remember. Last fall I started graduate school at The George Washington University; first as an MPH student studying health policy before transferring to the MHA program in the spring. My cohorts, professors, friend and experiences have all at times contributed to the feeling I am exactly where I belong. 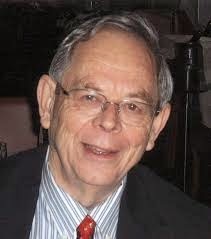 My father, however, has been an omnipresent lens through which I view my studies, health care, and the world. My father was the oldest of eight children born to a high school teacher in rural Pakistan. By all accounts he was as smart as they come with a work ethic to match. The top national score on standardized tests soon landed him spots in highly regarded secondary and then medical schools in the burgeoning metropolis of Lahore. After finishing med school and opening a small practice outside the city, he made the decision to come to the United States and pursue a residency. In the interim, he found a position in the small coal-mining town of Man, WV. Following a residency in Detroit, my father settled down to practice internal medicine in a small town called Michigan City, Indiana. It was 1981 and he made the decision to open his own practice, despite having no formal business education. However, he always understood and could relate to people. Maybe its because his own was impeccable, but he always seemed to be a good judge of character. He made one very smart managerial decision: he surrounded himself with great people. He hired two nurses. One was a young woman by the name of Pam who had very little training and experience. My father was not bothered with that and saw promise in her. He spent the time to train and educate her, and today she remains one of the longest tenured and most trusted nurses in the community. The other was a woman named Mary Griggs. Mary was a seasoned, quick witted, sharp-tongued woman you did not want to cross. She handled nursing duties, medical records, finances and front office duties. If Lean Six Sigma had been around at the time, Mary would have been a master black belt without breaking a sweat. As someone fascinated with operations and management, my favorite statistic involving Mary was she collected on 95% of bills. Over the years, the three of them stayed together through the different organizational structures my father was in. For a long time I never really understood the dynamic; the three of them were vastly different people. It wasn’t until I met other successful leaders and studied management concepts that I understood. My father had that uncanny ability to be present with whomever he was with. He never saw himself as the boss, but as a team member. My favorite story involves his rounding. As a child I would sometimes what on earth could make my dad set his alarm so unbelievably early every day. He was always the first one to the hospital in the morning. He liked being able to spend time with his patients, talking to them about more than just their medical care. My father had a fondness for coffee, and his colleague said as soon as he got on the floor he would pour himself a cup in a small white styrofoam cup. He would sit down with each patient and sip from the cup while he talked to them, never finishing it and leaving it on a table somewhere in the room before getting to the next patient with a new cup. 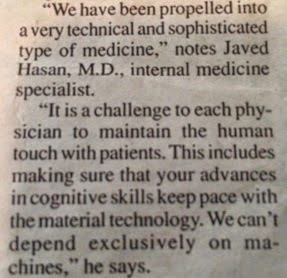 His fellow physicians admired his work ethic but also become competitive, so it became a game to try and beat Dr. Hasan to the hospital floor. Dr. Raheem, a long time friend and colleague of my father, said one time he thought he beat him. He didn’t see his car in the lot, hadn’t seen him yet in the hallway, but after walking into his third or fourth patient’s room he noticed a half empty cup of coffee in a white styrofoam cup and knew that he had once again been beat. My father never saw it as competition though. To him it was about providing his patients the care he saw as part of his duty as their physician. As retirement approached, everyone who knew him was excited my father might finally take some time to relax and not work so hard. I knew better, because for him medicine had become his love. Not because of the practice itself, but for the way it allowed him to serve others. It came as no surprise to me then that he decided to apply for the a license to practice medicine in the state of Texas, his intended place of retirement. The application process was not simple. It required passed exams and endless forms with very arbitrary deadlines. My father became rather obsessed with obtaining the license. Helping him one night in an attempt to beat a deadline requiring a complete reset of the entire process, I asked why he was doing it. He didn’t plan on finding a job, didn’t really need the money and had earned the time to rest and relax. I knew the answer before I even finished asking; he wanted to find a free clinic to volunteer his time and service. It was never work for him. Last year he was diagnosed with Stage IV pancreatic cancer. When the oncologist came in to give us the news, he presented the level of metastasis and asked if my dad wanted to hear the options. I looked at him and will never forget the stoicism with ever so slight shades of both a smirk and sadness on his face as he calmly said no thank you, he would just go home and let come what may. Over the next month he resigned himself to being on the other side of the physician patient relationship. We consulted palliative care, nephrology, radiology, cardiology and oncology to maximize end of life comfort. Through it all, I marveled at what a great patient he was. He never complained, always treated nursing staff, PA’s, housekeeping, hospital services and hospice staff with the utmost respect, and often a joke or two. Everything I had ever learned about health care from his time as a physician was magnified watching him as a patient. Sometimes it takes something very personal to provide humanity to terms like patient satisfaction and quality of care. Some months after his passing, the community hospital he spent his life serving in Indiana held a memorial service for my dad. I expected to see some old family friends, colleagues and hospital staff. What I was not prepared for was a roomful of former patients. One by one, when the podium was opened up for any to speak, they stood at the microphone often in tears talking less about specific procedures, ailments or care stories, and more about how much they trusted him as a physician and a person. How nice it was to have a primary care provider they considered a friend. How comforting he was in their toughest times. How my father was really a part of the community, had been their doctor for decades and was now their children’s doctor. My father taught me a lot about medicine and health care. That education paled in comparison to how much he taught me about humanity, and new lessons come every day from his memory and example. 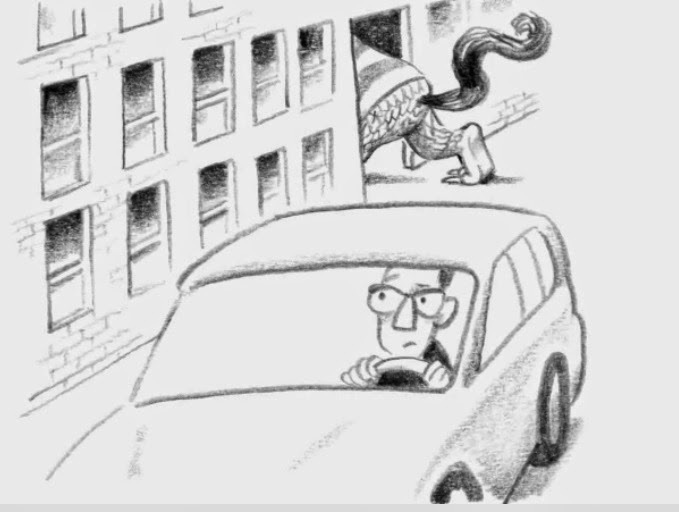 Take five minutes to listen to this lovely interview between Terry Gross and Maurice Sendak, taped a few years ago. Great graphic accompaniment, too, by Christopher Niemann. Make sure to hear his last three sentences. Now, this was a great day in 1991. Instead of having a big event with elected and regulatory officials who would have stolen the scene, we quietly went to Deer Island and--with the guys who had loyally and with little support run the treatment plant for years--went down into a vault and--at 10:23am--simply shut off the sludge discharge line. For almost four decades, tons of sludge -- the smelly, gooey, black byproduct of the sewage treatment process, laced with heavy metals and toxic chemicals -- poured daily into Boston Harbor, making the water black and foul-smelling, suffocating bottom-dwelling creatures, contaminating the sediments, depleting the oxygen, and sometimes killing fish. 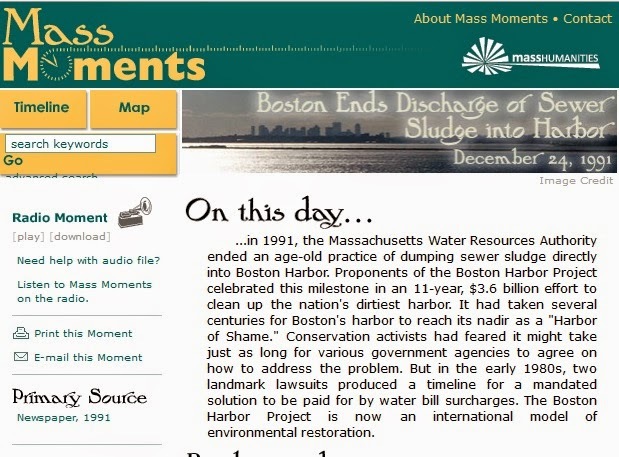 This was the beginning of the recovery of "the dirtiest harbor in America." It is now swimmable and fishable. The administration’s agreement with China on greenhouse gas emissions was less dramatic. It was quietly negotiated over months by the State Department’s climate negotiator, Todd D. Stern, and the White House’s adviser on climate issues, John Podesta, who went to Beijing a week before Mr. Obama to try to nail down the details. But it, too, had its made-for-the-memoir moments. In October, Secretary of State John Kerry played host in Boston to China’s top foreign policy official, Yang Jiechi. Over lunch at a Legal Sea Foods restaurant, Mr. Kerry pointed to Boston Harbor, saying it had been cleaned up by environmental regulations. The visit evidently made an impression on Mr. Yang: A month later, Mr. Obama and President Xi Jinping stood together in the Great Hall of the People to announce they had reached a landmark deal. But I bet John left out some of the details. Like the fact that the regulations had been in place for well over a decade, but the Commonwealth of Massachusetts (where he had been Lt. Gov.) had to be brought to federal court to comply with them. It took a lawsuit from the Conservation Law Foundation, headed by Doug Foy, to force a compliance plan under the Clean Water Act. The delay was used effectively by George Bush in his presidential campaign against Mike Dukakis, neutralizing the latter's much more extensive environmental credentials by saying, "My opponent will say that he will do for America what he's done for Massachusetts. No, that's why I fear for the country.'' Here's the video. Indeed, the state's delay in the cleanup was later termed one of "the most expense public policy mistake in the history of New England" by EPA Regional Administrator Michael Deland. Well, almost. The EPA itself had failed to enforce the law for many years and was first named as a co-defendant in the CLF lawsuit. Deland later switched sides and became a plaintiff with the CLF--a really neat legal maneuver! But perhaps John didn't want to spook the Chinese by suggesting that there should be an enforcement provision in the greenhouse gas agreement! High risk patients admitted with heart failure during meetings had a 30-day mortality rate of 17.5%, compared to 24.8% when more cardiologists were there. 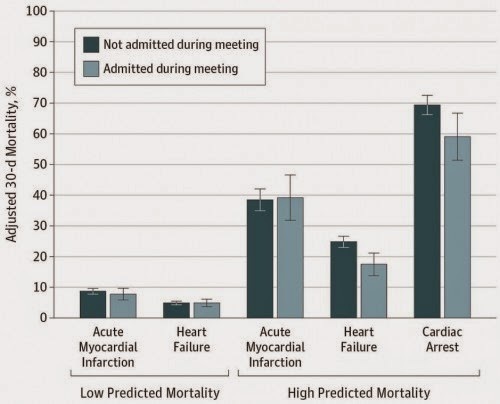 Cardiac arrest 30-day mortality was 59% during meetings and 69.4% at other times. There are a number of ways to interpret this. Maybe the best cardiologists were the ones who stayed home. Maybe with fewer cardiologists available, fewer invasive procedures get done, and that leads to better outcomes. Maybe they tell more low-risk patients to wait when fewer cardiologists are available, which gets the higher risk patients more attention and better outcomes. Maybe it’s something else. I favor the second explanation and am reminded of the excellent judgment of my PCP back in 2007 when I was asked by the touring company to take a stress test before a two-week long kayaking trip to Patagonia. She says, "No. I refuse to order a stress test for you." "Here's the deal," she says. "If I order the stress test, our especially attentive (knowing who you are) cardiologist will note some odd peculiarity about your heartbeat. He will then feel the need, because you are president of the hospital, to do a diagnostic catheterization. Then, there will be some kind of complication during the catheterization, and you will end up being harmed by the experience." " I will not authorize a stress test." Cravings, tolerance, withdrawal, cross-sensitization, cross-tolerance, cross-dependence, reward, opioid effects. Sugar stimulates brain pathways just as an opioid would, and sugar has been found to be habit-forming in people. Cravings induced by sugar are comparable to those induced by addictive drugs like cocaine and nicotine. And although other food components may also be pleasurable, sugar may be uniquely addictive in the food world. For instance, functional M.R.I. tests involving milkshakes demonstrate that it’s the sugar, not the fat, that people crave. Sugar is added to foods by an industry whose goal is to engineer products to be as irresistible and addictive as possible. Today added sugar is everywhere, used in approximately 75 percent of packaged foods purchased in the United States. The average American consumes anywhere from a quarter to a half pound of sugar a day. Focusing narrowly on added sugar could have unintended consequences. It could prompt the food industry to inject something equally or more harmful into processed foods, as an alternative.A better approach to sugar rehab is to promote the consumption of whole, natural foods. Substituting whole foods for sweet industrial concoctions may be a hard sell, but in the face of an industry that is exploiting our biological nature to keep us addicted, it may be the best solution for those who need that sugar fix. Many women today are hearing about the claimed advantages of robotic surgery for hysterectomy, thanks to widespread marketing and advertising. Robotic surgery is not the only or the best minimally invasive approach for hysterectomy. Nor is it the most cost-efficient. It is important to separate the marketing hype from the reality when considering the best surgical approach for hysterectomies. At a time when there is a demand for more fiscal responsibility and transparency in health care, the use of expensive medical technology should be questioned when less-costly alternatives provide equal or better patient outcomes. Hysterectomy is one of the most common major surgeries in the US and costs our health care system more than $5 billion a year. At a price of more than $1.7 million per robot, $125,000 in annual maintenance costs, and up to $2,000 per surgery for the cost of single-use instruments, robotic surgery is the most expensive approach. A recent Journal of the American Medical Association study found that the percentage of hysterectomies performed robotically has jumped from less than 0.5% to nearly 10% over the past three years. A study of over 264,000 hysterectomy patients in 441 hospitals also found that robotics added an average of $2,000 per procedure without any demonstrable benefit. Our patients deserve and need factual information about all of their treatment options, including costs, so that they can make truly informed health care decisions. Patients should be advised that robotic hysterectomy is best used for unusual and complex clinical conditions in which improved outcomes over standard minimally invasive approaches have been demonstrated. I guess the word didn't make it to Great Falls, Montana. 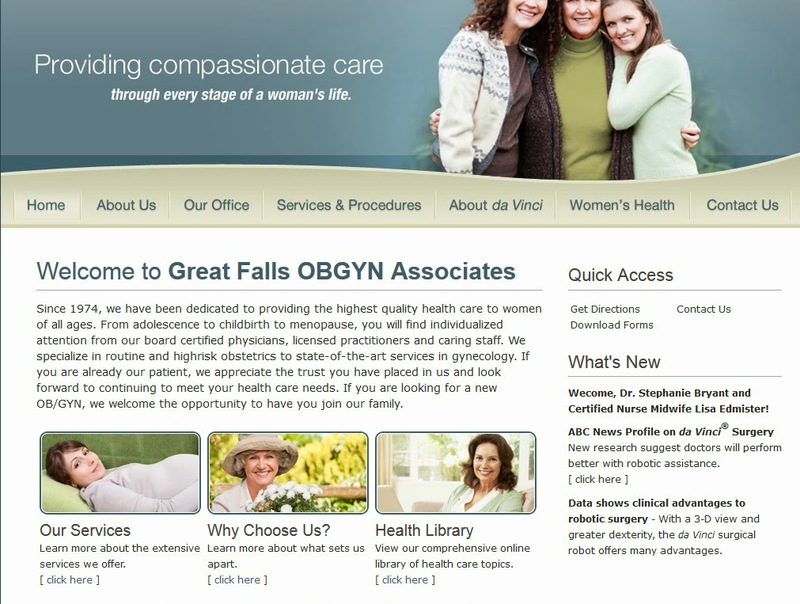 Here's the website for Great Falls OBGYN Associates, whose providers are members of ACOG. da Vinci Single-Site hysterectomy is available for benign (non-cancerous) conditions. Your uterus can be removed minimally invasively through a small incision in your belly button. da Vinci Single-Site technology allows for virtually scarless results. Content provided by Intuitive Surgical. Here's a lovely video summary of the Telluride Summer Patient Safety Camps that are conducted for residents and medical students. The official name is now: Academy for Emerging Patient Safety Leaders: The Telluride Experience. If you know anyone who might be interested, please have him or her apply, here, by January 15. "As a patient or family member in a hospital, what are your assumptions and expectations with regard to medical students and residents when it comes to patient safety?" I promised to respond to your comments, and I will, but first, I'd like to reprint an excerpt from Gene Lindsey's weekly email message to his friends and colleagues, for I think it sets the scene nicely. Although I graduated with honors and was fortunate to match with an excellent internship and residency program, I graduated as a physician in name only. In retrospect medical school for me was not much more than a big vocabulary lesson. By graduation I was well versed in the “what” of medicine and my clinical rotations had been an effective introduction to the “how” of hospital practice, but I was very short on the understanding of “why” and the complexity of effective practice especially in the ambulatory environment. I could talk like a doctor or at least pass for an intern. I looked the part. I knew how to do a few things and was rapidly gaining the swagger associated with increased confidence in my ability to tap fluid off of the water soaked lungs of a patient who was short of breath, do a lumbar puncture as part of a fever work up, or rapidly and effectively respond to a code. What took a lot longer to gain was confidence in my ability to meet a patient, understand them, appreciate the world they came from, really know their concerns, translate those concerns into a medical assessment, and finally help them understand what I had formulated and then help them choose a path forward. I think that my mentors or something in my development taught me to search for the equivalent of the IHI’s admonition to ask “What matters to you?” But putting that combined process of inquiry, empathy, discovery, diagnosis and treatment into practice is hard work. Incorporating that mind set of patient centrality into all of the vocabulary, clinical skills, and social awareness is a long slow learning process that consumed many more than the 10,000 hours Gladwell says is the foundation of competence. Wow, as a non-doctor, I am impressed with how hard it is to get good at this profession/craft/art/science. And note that Gene's remembrances don't even cover the additional topic about which I asked, patient safety. Let's see what your expectations are. Many of you raised the issue of training: Andrew expects "that they have a high level of training for what they are asked to do and that safety [is an] important part of that." From across the Pond, Anne Marie hopes "that they are working within their frame of competence." An anonymous person expects that "their training is a systematic, tested, and reviewed process, as evidenced by defined skills, knowledge, and abilities." But you also recognize that these folks are trainees and therefore might not know the answers. Therefore you hope for self-awareness of their limitations and also expect that supervisors will be available to step in when help is needed. On the first point, from Down Under, Kim hopes that they will "know their limits and seek help whenever needed." Kashif likewise says, "If there is any gray area, doubt or question, it is incumbent on the student - and should be part and parcel of the learning process - to ask for clarification and education from an attending or other superior." Anonymous adds that the other part of the equation must also be present: "I would expect that there's someone around who is accessible that the trainees could turn to, with immediacy and in-person, when they're in over their head. And, I'd expect that that person would be around sufficiently to recognize when a resident or med student is in trouble with regard to understanding what's happening with a patient, even if he or she does not." And, now, turning directly to the issue of safety, Bart assumes "that they're better oriented toward safety [than older doctors] since they're newly trained." E-patient Dave wants them "to follow documented safety procedures and welcome my questions (and my family's) and our attempts to help keep things safe." Nonlocal MD expects "exactly the same from them with regard to patient safety as I would expect from their attendings or, indeed, any doctor - awareness and attention to safety best practices." Hilary then adds an important proviso, hoping "that residents, medical students -- and anyone in the hospital -- are empowered to speak up if they see a patient safety issue. More fundamentally, that they are supported by faculty and a hospital system which make patient safety a priority." "[T]here clearly needs to be a place to go (likely even anonymously) to report on patient safety issues that the student observes. "Reporting is not with a punitive goal, but with a goal of protecting patients and supporting quality improvement. The organizational system where the student is placed ought to support this ability to report without fear of retribution or negative consequences for the reporting student." OK, now let's turn to reality, which is nicely represented by a number of participants at the Telluride Patient Safety Camp, captured in submissions on the camp blog. On the issue of training, it is not uncommon to hear from residents that their cumulative training in safety and quality issues during four years of medical school and two to three years of residency is in the vicinity of three hours. AWilliams noted: "My school has a Patient Safety elective (of which I am on the waitlist for), but beyond that we are given no formal training in the Patient Safety Culture." Thinking about cognitive, communication, and team behavior determinants of safety and quality, Giana O'Hara noted: "I am struck by the lack of education in our institutions. Today’s lessons were profoundly important and informative, yet, our schools do not have room for things in their education such as human factor engineering and negotiations. They don’t even make time for true team building!" JHollorman learned lessons at Telluride that had never been presented during formal training. Among them: "Our own human fallibility causes us to deviate from safety protocols in the face of stress, make conclusions based on cognitive bias rather than real information, and underestimate our likelihood to cause an error." The Lucian Leape Institute at the National Patient Safety Foundation released today a report that finds that U.S. “medical schools are not doing an adequate job of facilitating student understanding of basic knowledge and the development of skills required for the provision of safe patient care. I remember a conversation with the dean of a well known Boston medical school three years ago when I suggested that these items be added to the curriculum. "Our faculty aren't interested in that," he said dismissively. His students are now the ones taking care of you, the ones you expect will be trained in quality and safety matters. And, finally, let's turn to Hilary's and Paul's hope, that students and residents will find an open and welcoming environment within which to report areas of concern, or specific instances of patient harm. Again, as we all know from experience, this is observed more in the breach than in the reality. The ACGME's CLER Program mandates that these features be included at hospitals that sponsor residency programs. "How's it going?" you might ask. Well, we can't find out because the ACGME will not release the results of its assessments. If the medium is the message, the lack of transparency evidenced by the residency supervisory body is a clear indication of its poor understanding of the importance of meeting these educational criteria. I offer all of these comments not to get you overly discouraged but to suggest that the patient safety movement and its advocates are missing a big topic. In their focus on process improvement, patient engagement, and the like, they are missing the fact that much hope lies with the coming generation of doctors. In our zeal, for example, to require reporting of hospital acquired infections and never events, or to pursue changes in the payment system to supposedly prompt better management of care, we neglect the coming generation's need for education and support. Here are some random thoughts about Ebola. Remember when it used to be in the headlines? I recently read Jose Saramago’s fictional 1997 novel, Blindness, in which mass hysteria ensues as an inexplicable epidemic of white blindness sweeps through a town. Widespread panic marches through the community. The government, in an attempt to control the contagion, reacts by enacting increasingly repressive and ineffective measures. Victims are quarantined in a derelict asylum under armed guard, and left largely to fend for themselves. Social order breaks down rapidly both inside the crowded, filthy asylum and outside of it, in the community, as people begin to treat one another with fear and suspicion. The breakdown of social infrastructure and basic decencies leads to even worse afflictions. It is a remarkably prescient account of how humans react to something that scares us. Another friend who has been working on the front lines of Ebola planning and response humorously noted that the most significant advance in rational American preparedness for the disease occurred on November 5. Why? This was the day after election day. 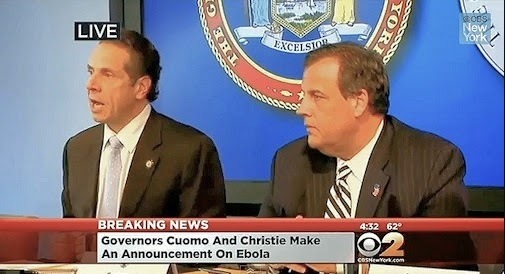 My friend noted that the bad behavior of several governors, most notably Chris Christie and Andrew Cuomo, had simultaneously made outcasts of the extremely dedicated health care workers who had volunteered in Africa and unnecessarily raised undue concern among the American public as to the actual danger to the US population. It remains unreported whether the governors had read Saramago's book. Meanwhile, recall that the federal government originally designated under two dozen hospitals nationwide to accept Ebola patients. Here's the map from October. But many places felt left out--both for reasons of ego and finance (i.e, looking for a share of the multi-billion emergency appropriation, including $166 million for hospital preparedness and support). So by December, there were 35 designated hospitals (with more to come--at least one in each state suggests the President, counting votes in the Congress.) I'm sure the list, though, is based solely on a logistical and scientific determination of need. Wait, did I mention the amount of requested funding, over $6 billion? Here's the page with the CDC case counts, both for the US and abroad. Fewer than 20,000 cases worldwide, and 4 in the US. In American hospitals alone, the Centers for Disease Control (CDC) estimates that hospital acquired infections (HAIs) account for an estimated 1.7 million infections and 99,000 associated deaths each year. Priorities? Even Saramago would be unable to write a fictional account that is more strange than reality. This column was originally to be focused on Uber, which allowed its shortage algorithm to increase the prices of taxis out of the Sydney central business district by four times during the recent hostage episode--and who, at first, responded to complaints by saying, "Well, we need to increase prices to encourage more drivers to enter that sector of the city." This tin ear to public opinion got them in a heap of trouble, even though they later changed their tune and offered people free taxi service during the crisis. Heartland, which is in the process of changing its name to Mosaic Life Care, seizes more money from patients than any other hospital in Missouri. From 2009 through 2013, the hospital's debt collection arm garnished the wages of about 6,000 people, according to a ProPublica analysis of state court data. After the hospital wins a judgment against a former patient in court, it's entitled to take a hefty portion of the patient's paychecks going forward: 25 percent of after-tax pay. For patients who are the head of household, if they tell the hospital or court that information, the hospital can seize only 10 percent of each paycheck. But Heartland, through the debt collection company Northwest Financial Services, often sues both adults in a household — garnishing one at the 10 percent rate and the other at the full 25 percent of their pay. The hospital also charges patients 9 percent interest, the maximum allowed under state law. In 2006, the hospital sued the Heries and got a court judgment against them for the full bill plus legal fees — more than $18,000 in total. Ever since, the hospital has been taking 10 percent out of Keith Herie's paychecks. To make some more money, Kathleen Herie got a low-wage retail job at Sam's Club. But then Heartland hospital began seizing 25 percent of her paychecks after taxes — meaning both she and her husband were now getting their pay docked at the maximum level allowed under state and federal law. On top of that, the hospital placed a lien against their home — which also prevents them from refinancing. According to a Heartland operations memo, this is done in all cases in which the company has won a judgment exceeding $1,000. In 2010, Heartland sued Keith and Kathleen Herie again. Keith was experiencing chest pains, had tests done and ended up with new bills totaling upwards of $10,000. But this time, based on his income on his tax returns, the couple could have qualified to get their entire bill forgiven under the hospital's financial aid policy. But they say nobody told them that. They didn't formally apply for aid. So the hospital charged them the full bill and garnished their wages again. Altogether, over the years, the couple has paid $19,779 through garnishments, according to court records. They still owe $25,739. The Heries' case highlights a key point: When a hospital garnishes patients' wages, it learns how much they make. But even if the patient is very low-income, Heartland doesn't consider that. Once you get sued, you no longer qualify for assistance. "The time to do that would have been back when you got the bill or when the bill initially went to collections," Wagner says. Hospital spokesperson Tracey Clark says charity care is reserved for patients who "seek it and legitimately work with us." Meanwhile, the hospital is seizing the wages of many patients who could qualify for free or reduced-cost care. Heartland is a non-profit hospital. It made $605 million in gross revenues last year, and $45 million of that was profit, an 8% margin in a business where 2-3% margins are the norm. If you haven't answered the question I pose below, would you please do so as a comment on that article? It requires no technical knowledge, and I'd value your opinion. Thanks. I hear through the grapevine that my July post about U. Mass Memorial Health Care in Worcester was not well received by some colleagues in Central Massachusetts. I can certainly understand that, as I did not portray an optimistic prognosis. I certainly hope to be proven wrong, and recent numbers from that quarter look better, as reported in this story by Lisa Eckelbecker at the Worcester Telegram. Dr. Dickson, by all accounts, is a thoughtful, honest, and effective leader, with a terrific sense of what it takes to improve hospital work and clinical processes. Our first Idea of the Week comes from a team who has taken these principles to heart, the Anti-Coagulation Center staff. After reading an article about how patient perception of quality of care begins in the reception area, team member Pam Burgwinkle, a nurse practitioner and manager of the center, brought the subject up at her team’s idea huddle and collectively they examined some of the topics discussed in the article. Pam was looking for ideas about how they could demonstrate to patients UMass Memorial’s commitment to patient centered care. As always our care givers had lots of great ideas including ensuring the reading materials are current, adding plants to the reception area and making sure the patient education material is fully stocked. Finally the team came up with their best idea adding a USB port charging station so our patients can keep their phones charged and provide updates to their family and friends. It is out of such engagement and creativity that progress occurs. There is a leadership and team building example here that has value to hospitals everywhere. Best of luck to Eric and his team at U. Mass. I hope and trust you will prove my earlier post to be totally off base! Amid calls from state and local officials to retain an ER in a city with more than 93,000 residents, Steward announced Tuesday that it has filed a letter of intent with the state’s Department of Public Health to open a satellite ER in the hospital’s existing emergency department at 114 Whitwell St. The for-profit company said it still plans to close the rest of the 124-year-old hospital by Dec. 31. Steward said the satellite ER will be open 24 hours per day, seven days per week, and it will be staffed with physicians and nurses. There will also be on-site diagnostic radiology and laboratory services. Patients with serious emergencies or who need inpatient services will be taken to other acute-care hospitals. Deborah Socolar, a North Quincy resident and former co-director of the health reform program at Boston University’s School of Public Health, said she is concerned about how the satellite ER will be staffed. She said some of Quincy’s ER workers were under the impression it would close Dec. 31, so they got new jobs. Socolar said news of the ER staying open, although welcomed, doesn’t change the fact that Quincy is about to lose its hospital. “It’s obviously still a loss for the city to not have a full-fledged ER that would have operating rooms upstairs and as a result would be able to handle a wider, more diverse array of patients,” Socolar said. But it really goes beyond that, doesn't it? Do you really want to give the impression to the public that an ER exists when there is no connection in the building to the kind of services that might be needed for emergent patients? What are the clinical ramifications of the delay associated with accepting a patient for triage and initial treatment in Quincy and then bundling him/her up for transport to another hospital? Some percentage of patients will be better off going directly to a real hospital's ER directly. Who is going to make that judgement? If you were an EMT with a patient in your ambulance, what choice would you make? If you have concerns and you call ahead to the Quincy ER, you are likely to hear, "Best to take the patient directly to a full service ER." Look at these two maps. If you need emergent care and live in the north or west part of Quincy, you may well be better off going to BID-Milton from the start (above). 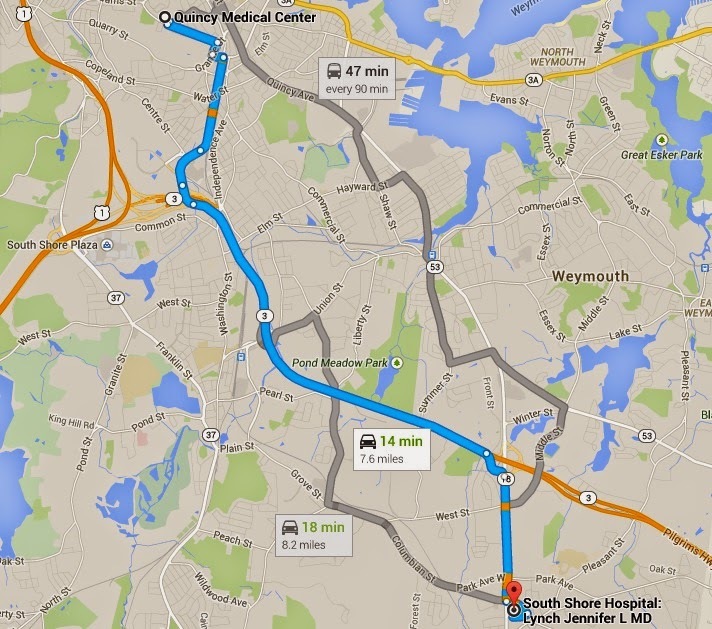 If you live in the south or east part of the city, you may well be better off going directly to South Shore Hospital (below). In short, a good portion of those 93,000 Quincy residents will not need or want a satellite ER. Here's my prediction: After the six-month trial period, this facility will be quietly closed, citing a lack of business. The ambulance drivers and the public will vote with their feet. provide opportunity for sponsoring institutions to demonstrate leadership in patient safety, quality improvement, and reduction in health care disparities. The question remains, months later: Where is the data that the ACGME collects about this important GME quality and safety curriculum? Why can't medical students who are interested in joining hospitals with vibrant patient safety and quality programs see it during their residency match process? And fundamentally, why won't the ACGME model the kind of transparency that is needed to bring about clinical process improvement? It struck me that this old Dilbert cartoon characterizes many hospitals. The situation described may present a problem as they try to run ACOs to manage patient care under a risk-sharing model of reimbursement, especially when they must do so across many institutions and physician practices--each of which has the same problem of cost accounting. With thanks to Saskatchewan's Health Quality Council Chairperson Susan Shaw for the reference, please check out this short article on a near miss in a large community hospital. As with any near miss or drug error, there were a series of unusual circumstances that led to this product being placed on an anesthesia table top. Actually, many such errors do not require a series of unusual circumstances. It is the pattern of everyday work that often leads to preventable harm. Meanwhile, with thanks to Jan M. Davies, Professor of Anesthesia & Adjunct Professor of Psychology, University of Calgary, I add this short video from George Carlin about "near misses." Enjoy! I usually get nervous when something seems too good to be true, but every now and then the spark of human goodness comes through. Unless I am missing something, here's an example, sent to me on Twitter by Dr. Howard Green, @DermHag, a dermatologist in West Palm Beach. Here's a first look at Skinstamatic a ground breaking mobile collective sourced medical search app. http://youtu.be/W3Nfatzy9ZM. Very interesting. So the consult is free? Do users get some kind of priority for appts? Often hard to get one. Free. No priority just recognition of Skinstamatic user at this time although identified photobook is available to be viewed by Dr.
All in all, this looks like a generous use of social media capabilities from members of the profession. What do you think? My mission is to help make this book obsolete in 10 years! In the meantime, I hope it helps others navigate the system. What she meant was that each person in the hospital was unthinkingly engaged in a series of tasks that had become disconnected from the underlying purpose of the hospital. They were driven by their inclinations and imperatives rather than by the patient’s needs. Doctors and nurses face an abundance of tasks every day, and they apply their energy, creativity, and experience to those tasks. But, they often neglect to connect with the patients and families whom they are treating. This is a not a case of bad intentions. Indeed, these folks are among the most well-intentioned people in the world. "No, I did not contact you. I'm sorry. I did what we always do. Dr. Simmon told me you had an issue with steroids but he saw the pros and cons of administering them. 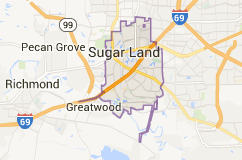 Dr. Hughes and I agreed it was the best course of action." "I spoke with Dr. Stark today and I understand your concern about steroids. I know you never met her before but she is my partner and I support her medical decision." He blurts this out, stating his position so clearly, that even with a bad [telephone] connection I hear him sharp. The tone in his voice seems like he is concerned about keeping a unified medical front, not about my son. "Doctor, Gary is not to have steroids until I understand the justification for taking them. Stop them immediately." I say it strong and clear. "I spoke with Dr. Hughes and Dr. Simmon and since Gary is going to have surgery in three days and he can withstand the pain, he doesn't need steroids. We will not be giving them to him. I don't think we can expect this kind of scenario to change. Many in the profession are not ready to change, and they've not been trained to do so. Also, they face innumerable new pressures and obstacles to providing patient-driven care. Randi learned this during her son's experiences in hospitals. She therefore developed a series of approaches and techniques to help insert herself into the care regime. 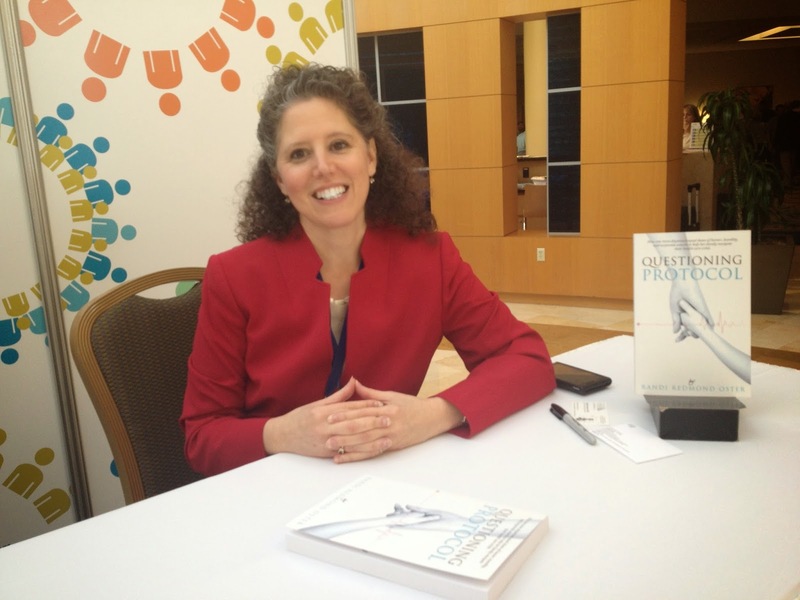 She calls the book Questioning Protocol, and by trial and error, she learned how to do so in a manner that was less likely to cause clinicians to be defensive and upset. She taught them how to become partners with the patient and his family. Things seem to change in the hospital from this point. Clearly, they must have written in Gary's records that we are to be made aware of everything and given the opportunity to ask questions. Now these strangers understand how we operate as a family. I understand they have a well-oiled machine they work in every day. They move through the machine gears ducking and turning in synchronization with each other, sometimes forgetting that a newcomer might be terrified. I think they believe that trust in the machine is essential. After all, they know they are the experts. I feel as if the machine slows down for them when I try to get up to speed. I see their frustration creep up. They have other people to process. The doctors are the first to say they do not have all the answers. I realize maybe that's why they don't like the questions. But this experience reinforces my resolve: Unless it's life-threatening, I must STOP the machine and understand exactly what is happening. I'm incorporating these new people into OUR team. Each chapter of the book contains a portion of her family's narrative, but then ends with two or three or four concrete pieces of advice for people who finds themselves in the clutches of the health care system. The advice is cogent and clear and helpful. I highly recommend this book. I don't think it will be obsolete, as Randi hopes, in ten years. Buy it now for when you'll need it. You will.